How long will the remarkably, but inexplicably, 11,000 years of global climatic stability last? Uncertainty abounds, but in meantime the risky experiment continues. Like “rats inside the experiment,” Neils Bohr Institute glaciology professor Jorgen Peder Steffensen says of us humans when he considers the risks of a sudden reconfiguration of global circulation which could, among other things, cause long-term drying across America’s breadbasket states. 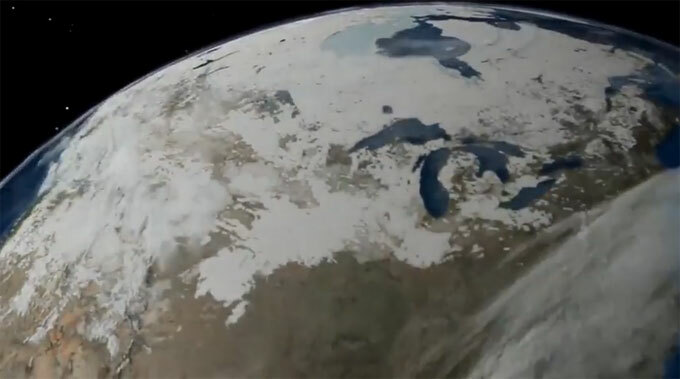 “That’s going to impact the entire world,” Steffensen cautions in recognizing that the 11,000 years of the interglacial period since the last ice age “has been unreasonably stable. And we don’t know why” or how long that stability may persist. Steffensen, in exceptionally eloquent and straightforward language, acknowledges that models consistently point to a gradual global increase in temperatures as a result of the continue widespread combustion of fossil fuels and increased emissions of carbon dioxide. “But that’s assuming the climate plays nice,” he says. Interviewed by Yale Climate Connections regular videographer Peter Sinclair in Kangeraussuaq, Greenland, this past summer, Steffensen, a professor of glaciology, sees an analogy between the continued emissions of greenhouse gases and the risks posed to the U.S. and global economy by the 2006/2007 widespread sales of subprime loans. Deeply involved in drilling of ice cores on the Greenland and Antarctic ice sheets since 1980, Steffensen says in this month’s “This is not cool” video that changes in global heat flows have “come about suddenly” in the past and “are reflected, as a mirror image,” in Antarctic ice cores. But he is concerned that human activities could be “tipping the climate into an intermediate period of climate changes…. We can face a climate change that happens just as fast as the financial crisis,” Steffensen says. In that case, agricultural activity worldwide could be adversely affected … “the weather will change, and it will not change back” quickly.